Please click here for a full list of the organisations we have supported. 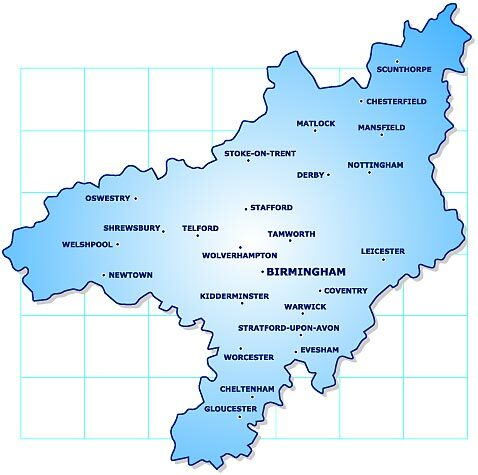 Below is a map of the area that is covered by Severn Trent Trust Fund. The purpose of the Trust is to help individuals living in premises supplied by Severn Trent Water who are in need, poverty or distress and cannot afford to pay their water charges. As well as providing grants directly to people in need, Trustees also recognise the value of offering longer-term support to encourage financial stability. This is achieved by making grants available to community organisations working within the Severn Trent Trust Fund area that can deliver free-at-source money/debt advice and financial literacy services to help local people. This type of grant would contribute towards the costs associated with the delivery of a longer-term project that fulfils Trustees objectives. The current maximum funding term is 3 years, dependent on the availability of funding. This type of grant is a one-off award and typically would be used to enhance or develop current money/debt advice and financial literacy services within an organisation. This may be the purchase of essential capital items to improve efficiency, provision of appropriate staff training or promotional activities. These are only a few examples; the Trust is always willing to consider providing support in other ways that will provide appropriate benefits. Please contact us on 0121 321 1324 or email us at office@sttf.org.uk and we will be happy to discuss current criteria and future funding opportunities.